Advance Chess: A Pre-Dawn to the Age of Superlative Bionic Robotic Intelligence Capabilities. International Serial Book Number - I.S.B.N. International Serial BOOK Number = ISBN ISBN.9781478718567.com Hardback ISBN.9781478717195.com Paperback AMAZON : Create Space: Book 1 Vol. 1 - The Single Set Games ISBN.9781503269484.com ( CreateSpace Assigned ) ISBN.1503269485.com BISAC: Games/ Chess 8.5 " X 11 " Full Color on White paper 190 pages CreateSpace eStore : https://www.createspace.com/5111243 Book 1 Vol. 2 - The Single Set Games 8.5" x 11" ( 21.59 x 27.94 cm ) Full Color on White Paper 154 pages ISBN.9781505573374.com ( CreateSpace Assigned ) ISBN.1505573378.com BISAC : Games / Chess CreateSpace eStore : https://www.createspace.com/5176071 Book 2 Vol. 1 - The Double Set Game (D2.10) 8.5" x 11" ( 21.59 x 27.94 cm ) Full Color on White Paper 190 pages ISBN.9781507648018.com ( CreateSpace Assigned ) ISBN.1507648014.com BISAC : Games / Chess CreateSpace eStore : https://www.createspace.com/5270498 Book 2 Vol. 2 - The Double Set Game (D2.30) 8.5" x 11" ( 21.59 x 27.94 cm ) Full Color on White Paper 152 pages ISBN.9781514136171.com ( Create Space Assigned ) ISBN.1514136171.com BISAC : Games / Chess CreateSpace eStore : https://www.createspace.com/5530268 Book 2 Vol. 3 - The Double Set Game (D2.50) 8.5 " x 11 " ( 21.59 x 27.94 cm ) Full Color on White Paper 190 pages ISBN.9781515309208.com ( Create Space Assigned ) ISBN.1515309207.com BISAC : Games / Chess CreateSpace eStore : https://www.createspace.com/5651227 Book 2 Vol. 4 - The Double Set Game (D4.2.11) 174 pages ISBN.9781518655456.com ISBN.1518655459.com Book 2 Volume 5 - The Double Set Game ( D4.2.31 ) 112 pages www.amazon.com/author/siafabneal Author's webpages URL : https://outskirtspress.com/ siafabneal http://www.tumblr.com/blog/3d-art/chessplayer3334 http://www.amazon.com/author/siafabneal http://www.independentauthornetwork.com/siafa-b-neal http://www.coldcoffeepress.com/siafa-b-neal http://www.bookmarketingnetwork.com/chessplayer3334 http://askdavid.com/reviews/book/chess/12467 http://www.chess.com/siafabneal http://www.chess.com/chessplayer3334 http://www.pinterest.com/chessplasyer3334 http://www.kobobooks.com/chessplayer3334 http://www.booksgosocial.com/chessplayer3334 http://www.instagram.com/chessplsayer3334 http://www.soundcloud.com/chessplayer3334 http://www.socialmedia.com/chessplayer3334 http://www.scoopit.com/chessplayer3334 http://www.bookdaily.com/chessplayer3334 http://www.CoPromote.com/chessplayer3334 http://www.dailymotion.com/chessplaye3334 https://www.youtube.com/chessplayer3334 https://www.vimeo.com/chessplayer3334 http://www.myspace.com/chessplayer3334 http://www.Copromote.com/chessplayer3334 http://www.scoopit.com/chessplayer3334 http://www.bookmarketingnetwork.com/chessplayer3334 http://www.independentauthornetwork.com/siafa-b-neal http://www.xing.com/chessplayer3334 http://www.awesomegang.com/chessplayer3334 http://www.booksgosocial.com/chesplayer3335 http://www.createspace.com/chessplayer3334 http;//www.goodread.com/chessplayer3334 http://www.socialmedia.com/chessplayer3334 http://www.twitter.com/chessplayer3334 http://www.facebook.com/chessplayer3334 http://www.kobobooks.com/chessplayer3334 http://askdavid.com/Review/book/chess/12467#websites http://askdavid.com/explore-books/chess http://www.coldcoffeecafe.com/page/chess-enthusiasts http://www.coldcoffeecafe.com/profile/SiafaBNeal Videos/ Audios : http;//www.soundcloud.com/chessplayer3334 http://www.dailymotion.com/chessplayer3334 https://www.youtube.com/chessplayer3334 Other: http://www.googleplus.com/chessplayer3334 http://www.instangram.com/chessplayer3334 http://www.scoop.it./t/advance-3-d-matrix-vector-chess-book.com https://www.youtube.com/chessplayer3334 http://www.dailymotion.com/chessplayer3334 http://www.bookdaily.com/chessplayer3334 http://www.askdavid.com/chessplayer3334 http://www.bookbub.com/chessplayer3334 http://www.linkedin.com/chessplasyer3334 http://www.goodread.com/chessplayer3334 http://www.bingbing.com/chessplayer3334 http://www.xing.com/chessplayer3334 http://www.awesomegang.com/chessplayer3334 KOBO BOOKS Publishing : Game Board : Model III Editions 1-4 : e-Books : http://www.xinxii.com/asresults.php?s4=siafa&isearchButton=search&sid=1 E-Books : Edition 1 Vol 1 - The Single Set Games International Serial BOOK Number = ISBN ISBN.1230000220598.com Edition 2 Vol. 1 - The Double Set Games International Serial BOOK Number = ISBN ISBN.1230000230922.com Edition 3 Vol. 1 - The Single Set Games http://www.xinxii.com/en/advance-chess-the-longitudinal-star-gate-14-p-353320.html Edition 4 Vol. 1 - The Double Set Games International Serial BOOK Number = ISBN ISBN.1230000245230.com 244 pages BooksGoSocial: http://www.booksgosocial.com/chessplayer3334 http://bit.ly/SFOVV9 Book Club Reading List: http://bookclubreading.com/advance-3d-chess Press Release: http://pressreleaseshq..com/advance-3-d-chess Linkedin.com: http://www.linkedin.com/pub/siafa-neal/72/242/252 Plan2win.com: http://plan2winai.blogspot.com/2015/09/author-siafa-b-neal.html Twitter: https://twitter.com/plan2winauthors PInterest: https://www.pinterest.com/plan2win/self-published-authors Book Reviews Diane Donavan's Shelf: http://www.midwestbookreview.com/mbw/jun_15.htm#donavan Recommended reading- June 15 th, 2015,Games: http://donavansliteraryservices.com/recommended-reading.html James Cox - Small Press Book watch- July 2014- The Gaming Shelf : http://www.midwestbookreview.com Featured Book, Book 1 Vol. 1 , Co-Promote : http://awe.sm/aL9z6 I.A.N. Interview: http://www.indieauthorsnetwork.com/2015/08/siafa-b-neal-ian-interview.html Inkdrop Interview with Kathy Reinhart : http://www.inkdropinterviews.com/2015/10/01/siafa-b-neal U-tube: http://youtu.be/2oE1458oh4g.com Videos / Audios : https://www.soundcloud.com/chessplayer3334 https://www.youtube.com/chessplayer3334 https://www.dailymotion.com/chessplayer3334 Library of Congress: MODEL I - The Star Fish Model Registration Number (#) : TXu 1-777-122 Copy Right Service Request Number (#) : 1-672-70-3461 MODEL II - The Latitudinal Star Gate 14 Model Registration Number (#) : TXu 1-782-217 Copy Right Service Request Number (#) : 1-69-12-47-801 MODEL III - The Longitudinal Star Gate 14 Model Registration Number (#) : TXu 1-806-095 Copy Right Service Request Number (#) : 1-732-082-811 Other Suggested related recommended readings : International Serial BOOK Number = ISBN ISBN.1503269485.com ISBN.1505573378.com ISBN.1507648014.com ISBN.1514136171.com ISBN.1515309207.com ISBN.1518655459.com Do you sometimes find that the classical game of conventional chess a bit boring ? Are you eager to learn the new, exciting concepts of Advance 3-D Chess ? If this is true , then this book will likely meet or even exceed your wildest expectations. Model III: The Longitudinal Star Gate 14 Model, raises the bar of conventional chess to higher levels of sophistication with challenging , new exciting concepts of Advance 3-D Matrix Vector Chess. The book which provides an out-of-the-box learning experience about the complexities and challenges of strategic games which are mind-boggling and mind-baffling, allows readers who desperately want to divulge into the pseudo-dynamics and quasi-kinetics World of Chess to explore and to exhaust the opportunities to test the plasticity boundary limit ranges of their full spectrum cognitive elasticity cognition capacities. This book also permits readers to explore and to exhaust the tapestry of the intense psychological warfare of Matrix Chess under the philosophical guidance of exhausting the possibilities to newer approaches to life. Everyone from the beginner to master of the game of chess can appreciate the true value of Model III which provides finger-nail-biting , seat-gripping excitement and pizzazz. This book also enables chess enthusiasts to test their intelligence capabilities concerning matters with regards to Logistics and Strategics Planning and Analysis and additionally advocates the World of 3-D Chess. Model III which is a must-have chess novelty book , presents Diagrams , Illustrations , Drawings and Photos about the space-age Advance Chess games- tools that makes relearning the game entertaining and easy to understand. This book also offers statements that displays symbolic mathematics and spatial relationships of the chess piece movements. The language of chess is indeed an expression of mathematical spatial relativity. By elevating the conventional game into a new and unique sphere, players may progress into the advance stages of 3-Dimensional chess. 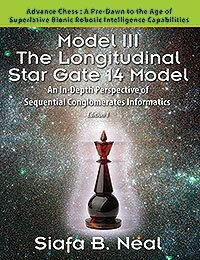 Model III : The Longitudinal Star Gate 14 Model is a once-in-a-lifetime book that provides readers with the ultimate battle plan, entertains chess fans who have higher expectation of the game and allows readers who have an open mind and who are receptive to the newer challenges of 3-D Chess to reexamine their Diagnostic and Prognostic approaches to the game. Readers who benefit from my book are : 1. those who may find that the classical game of conventional chess a bit boring. 2. those chess readers who are eager to learn the new , exciting concepts of Advance 3-D Matrix Chess. 3. those readers who are chess enthusiasts and have high expectations of the game. 4. those readers who have an open mind and are receptive to the new challenges of the game of chess. 5. those readers who seek finger-nail-biting , seat-gripping fun and excitement in the new exciting games of Advance 3-D Chess. 6. those readers who crave for hours of entertainment with non-conventional , out-of-the-box strategic games that are mind-boggling and mind-baffling. 7. readers who are avid Chess Players and who may fall in the spectral range ranks of Beginners , Intermediates , Semi-Professional and Professionals. 8. readers who play chess as a a hobby and who take joy in experiencing for the first time the learning experience about the complexities and challenges of the intense psychological warfare of Matrix Chess. 9. readers who crave for the ULTIMATE battle plan war games. 10. chess readers who desperately want to divulge into the pseudo-dynamics and quasi-kinetics World of Chess in order to explore and to exhaust the opportunities to test the plasticity boundary limit ranges of their full spectrum cognitive elasticity cognition capacities. 11. those chess readers who may want a different perspective to their intelligence tests for Logistics and and Strategics Diagnostics and Prognostics Analysis. 12. chess readers who want to acquire the new , exciting gaming knowledge of 3-D chess and want to progress ahead of the learning curve well above the Masters and Grand-Masters of the classical game of conventional chess. 13. chess readers who crave for the ULTIMATE Collector's item in Chess gaming. This book offers some important lessons for those readers who are open minded to newer opportunities to explore and to exhaust the tapestry of psychological warfare under the philosophical guidance to exhaust the possibilities to newer approaches to life. The book allows readers to Live for Greatness. The Greatness which comes their mind and heart. It espouses the philosophy that " You are what you think and you think therefore you are. " The book dares readers to explore and to rediscover their innate dormant passion for excellence in their quintessential cognition quest in a journey that provides fun and entertainment during the process. The legacy that I would leave behind for others to follow and emulate is to provide pioneering efforts in rediscovering and advancing the concepts of Advance 3-D Chess gaming and hopefully aspire others to not only allow the game to materialize into an Olympic sport where both humans and robots are competing participants but to also serve as a recreational activity for but Astronauts and Martian colonists alike on the Martian planet. My book differentiates from other similar chess genre books on the market in that it offers special unique Diagrams , Illustrations , Drawings and Photos about the space-aged games of Advance 3-D Chess , the first of any kind that is available in the marketplace. The illustrations in my chess book makes learning from it fun and easy to understand. The book also provides Equations that display the symbolic mathematical relationships of the chess piece movement and relativity. The language of chess is indeed an expression of mathematical spatial relativity. In summary, this book adds excitement and pizzazz to what may seem to be a boring conventional chess game. I have come up with newer ways of playing chess using 3-Dimensional models to enhance the potential dynamics and kinetics of the game. This allows players to exhaust and to explore the possibilities of the game of chess thus raising the bar to higher levels of sophistication. I wrote this book to add excitement and pizzazz to the game of chess whose etiquette was taught to me by my Dad , the Late David Franklin Neal , Sr. My intent is to allow chess players to tap into the 3-D chess game tapestry of almost unlimited possibilities and probabilities. Other suggested related readings: Library of Congress: MODEL I - The Star Fish Model Author : Siafa B. Neal Book Title : Advance Chess for Dummies. EDITIONS 1 - 3 Year of Completion : 2010 Registration Number (#) : TXu 1-777-122 Service request # : 1-672-70-3461 Registration date : November 2, 2011 Certification date : October 13, 2011 MODEL II - The Latitudinal Star Gate 14 Model Author : Siafa B. Neal Book Title : The Latitudinal Star Gate 14. Introspective Retrospection. EDITION 1 VOL. 1 / EDITION 2 VOLUME 1 . Registration Number (#) : TXu 1-782-217 Service Request (#) : 1 -69--12-47-801 Registration date : December 12,2011 Year of Completion : 2011 Certification date : November 28, 2011 MODEL III - The Longitudinal Star Gate 14 Model. Author : Siafa B. Neal Book Title : Advance Chess. The Longitudinal Star Gate 14 ( S.G. 14 ) Model. EDITION 1 VOL. 1 / EDITION 2 VOLUMES 1 - 2 / EDITION 3 VOLUMES 1 - 2 / EDITION 4 VOLUMES 1 - 3. Registration Number (#) : TXu 1-806-095 Service Request Number (#) : 1-732-082-811 Registration date : March 9, 2012 Year of Completion : 2012 Certification date : March 1, 2012 Hobbies : travel , languages , Game Board designs ( Advance Chess, Checkers (drought), Chinese Checkers, Kombochia ) , Architectural designs , Nautical engineering applications , Aerial engineering design ( structural ) , eco-tourism , swimming , sports ( tennis ) , sports mechanics , horse-back riding , photography ,walking , calisthenics . I dedicate the entirety of this book to my Savior, Jesus Christ for His tender Divine Mercies for sparing my life. I also dedicate this book to my loving mother, Anna B. Neal, through whose unconditional love and compassion allows me to complete this book. My fond memories jolt back to my youthful days when my dad, David Franklin Neal, Sr., taught me my first lessons in the etiquette of classical chess. Unfortunately, my junior brother Franklin never seem to respect those etiquette in those times when he was about to lose the game. He would simply scatter the pieces across the chess board. I am not sure if he would still do the same today. HA, HA. It is funny that old habits or inclinations to those habits sometimes never seem to fade away. The fascination of International Chess Competitions among professional players, like the Grand Masters from Russia, Gary Karpov, Kasparov and Vladimir Kraminik and the Grand Masters from the U.S.A. , Bobby Fisher and Paul Morphy, intuitively spark my desire to design chess games that require higher degrees of cognitive elasticity. My experiences in past chess games at the noncompetitive levels reflects a state of boredom. 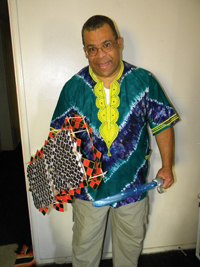 I find that by raising the levels of cognitive techniques, rules and applications of this mental warfare, an avid chess enthusiast would find no comparison to the scope, brevity, depth, dexterity and richness this Advance Chess game offers, to which may I add, was my design and may someday be marketable world wide. This brings into mind how little, we, as masters of the planet, use our mental capabilities for our daily decision making processes. We only use a minuscule fraction of our total mental capacities and thus cease to develop our minds to their full potentials thereby leaving it to remain in its infancy. The brevity of computers or application robotics, in conjunction with artificial intelligence, in comparison to the human mind is comparable to just a speck of sand along a vast ocean floor. The link to today’s progressive technologies has only widened the expanse of our understanding of the human mind and its network complexities. An adaptable developing mind is capable of adjusting and surviving the pressures of today’s rapid technological progression. The frequent use of the techniques that apply to the games of Advance Chess does produce, from my understanding of the biological synaptic composition of our minds, an alert conscious mind which is relatively free from the drawbacks of Attention Deficit Hypertension Disorder (A.D.H.D.) that is an ailment of many people globally. Thus, the techniques of play in the Advance Chess games require the use of a keen sense of concentration and a awareness of the rules and regulations pertaining to the model in question. This follows a common phrase, “Use it, or lose it.” The key to a successful completion for any Player in the Advance Chess Games is the willingness to have an open mind and a particularly keen awareness of the techniques, rules and applications that apply to that particular model. When I play Advance Chess whether it is solitaire (with an imaginary opponent) or with a challenger, I almost always apply the motto: “When you have exhausted all the possibilities, whatever remains, however infinitesimal, then becomes a possibility.” Enjoy and have fun while at play because, “You are what you think.” After all, it is not so much about the thrill of winning games as it is about the ardent quality of play as it relates to the rules and applications that precedes the Patterns and Processes of the logic sequential premise that Advance Chess offers. Contact information: Name : Siafa B. Neal Address: 5730 Dogwood Street, San Bernardino , CA 92404 Phone: (909) 886-4312 Fax : same Cell phone: (909) 327-8078 3-D Arts Paintings : https://www.tumblr.com/blog/3d-art/chessplayer3334 https://www.bingbing.com/chessplayer3334 https://www.googleplus.com/chessplayer3334 http://www.facebook.com/siafa.neal http://www.twitter.com/chessplayer3334 http://www.pinterest.com/chessplayer3334 Hobbies : tennis , swimming , soccer , reading , building Advance 3-D Chess models, 3-D Arts creations , photography, biking , horse back riding , photography , travel , languages , Scientific research about the psychological effects of Advance Chess on chess players. Best regards, Siafa B. Neal Grand-Master / Founder / Inventor / Instructor / Author ( www.amazon.com/author/siafabneal , www.booksgosocial.com/chessplayer3334 , www.coldcoffpress.com/ siafa-b-neal , www.independentauthornetwork.com/siafa-b-neal , www.xing.com/chessplayer3334 ) / Artist ( www.tumblr.com/blog/3d-art/chessplayer3334, www.googleplus.com/chessplayer3334 , www.bingbing.com/chessplayer3334 ) / Designer - ADVANCE 3 - D MODEL MATRIX VECTOR LOGISTICS CHESS.